The all-time saves leader will get "the call" Tuesday before the 6 p.m. official announcement. Joe Girardi, his former teammate and manager, said he'd be "somewhat" disappointed if Rivera isn't a unanimous choice. On Tuesday, Mariano Rivera will complete his journey from the humblest of beginnings to the Hall of Fame. The iconic closer, who grew up the son of a fisherman in the small Panamanian village of Puerto Caimito, saved a record 652 games in a 19-year career with the Yankees from 1995-2013. He will get “the call” from the Hall of Fame before Tuesday’s 6 p.m. announcement. Pitcher Roy Halladay, who died in a plane crash in November 2017 at the age of 40, appears all but certain to be elected in his first year on the ballot. So does designated hitter Edgar Martinez, who received 70.4 percent of the vote last year (an inductee must receive 75 percent from eligible Baseball Writers’ Association of America members). With just over 50 percent of the ballots calculated by Hall of Fame ballot tracker Ryan Thibodaux (Twitter: @NotMrTibbs), Martinez was on 90.3 percent of this year’s ballots. It will come down to the wire for former Yankee Mike Mussina, who received 63.5 percent of the vote last year and was on 81.2 percent of the known ballots this year, and Curt Schilling, who got 51.2 percent in 2018 and appeared on 71 percent of the 2019 ballots. Based on trends from the last few years in the final tally, Roger Clemens (57.3 percent last year) and Barry Bonds (56.4 percent) again look as if they’ll come up short. Many voters choose not to publicize their ballots before the final announcement. Much focus will be on whether Rivera, signed by the Yankees as an undrafted free agent in 1990 for the now unbelievable sum of $3,000, becomes the Hall’s first unanimous selection (Ken Griffey Jr. came the closest when he received 99.3 percent of the vote in 2016). Yet in many ways, that is irrelevant. Rivera, unanimous vote or not, is the greatest closer of all time, and in a sport rife with debate about almost everything, it’s nearly impossible to find someone to debate that. “To me, Mo was the perfect closer because (A), he was extremely athletic, (B), he was extremely durable, (C), he was extremely efficient,” Joe Girardi, a teammate and manager of Rivera’s, told Newsday’s Neil Best last week. The numbers continue to amaze. Besides the save total, 2.21 career regular-season ERA and 1.00 career WHIP, there’s the unfathomable 0.70 ERA and 0.76 WHIP in 141 postseason innings. And there’s the consistency, too. In his first full season as closer, 1997, Rivera saved 43 games with a 1.88 ERA. In his last, 2013, when he was 43, he saved 44 games with a 2.11 ERA. Girardi managed Rivera from 2008-13 and joined MLB Network as a contributor after the Yankees didn’t bring him back following the 2017 season. He said he would be “somewhat” disappointed if Rivera wasn’t voted in unanimously. A front-row seat to MLB's greatest closerRivera's journey has been as unlikely as the path of a cut fastball. 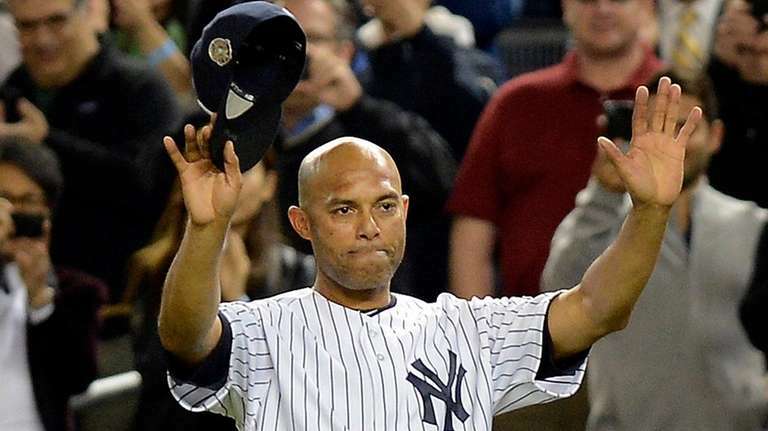 Mariano Rivera's final game at Yankee StadiumMariano Rivera made his final appearance at Yankee Stadium Wednesday night. Baseball Hall of Fame 2019Newsday's coverage leading into and of the announcement of the Baseball Hall of Fame's Class of 2019, including writer ballots, a look at Mariano Rivera, what players go through on announcement day and more.